The Central Section grew by more than a dozen schools this fall when 13 from the Central coast region moved out of the massive Southern Section. The Central Section keeps us on our toes by splitting some schools by gender into separate divisions. The CS only did that with two of the 13 newcomers, Paso Robles and Santa Maria. Here's how it breaks down (listed alphabetically): Arroyo Grande (D-I boys/girls), Atascadero (D-II b/g), Mission Prep (D-III b/g), Morro Bay (D-III b/g), Nipomo (D-III b/g), Orcutt Academy (D-III b/g), Paso Robles (D-I b, D-II g), Pioneer Valley (D-II b/g), Righetti (D-III b/g), San Luis Obispo (D-II b/g), Santa Maria (D-II b, D-III g), St. Joseph (D-III b/g), Templeton (D-III b/g). 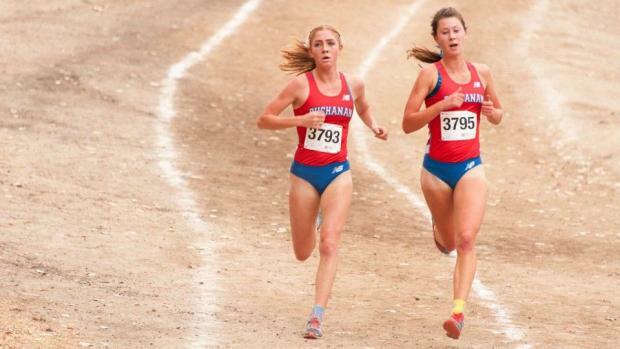 The section is also home to Buchanan High girls runners Corie Smith and Meagen Lowe (pictured), two of the best in the country. They placed 1-2 in the State D-I final last year.